If you are looking for a nice clean hotel with spacious rooms and bathrooms and all that within a moderate budget, then Bella Vista can fit in quite well. It's located in Padang Matsirat and the main advantage is its close proximity to the airport. So if you are planning to visit Langkawi for the Langkawi International Maritime Airshow (LIMA) which is held at the Mahsuri International Exhibition Centre near the airport, then Bella Vista can be a great choice for its location advantage. From the road the hotel with its European architecture looks gorgeous. It gives an impression of a large and spaced out property which it is. This is a relatively new hotel and has been built in 2012. While there is no beach nearby (the Pantai Cenang Beach is about 10 minutes drive), the hotel does overlook the Andaman sea and the lush forests around it. As you walk into the lobby area, the friendly staff will greet you and ensure that you have a smooth check in process. There are 73 rooms in Bella Vista property, and all rooms have private balcony that overlooks the pool, the forests and the sea. So if you want a clear sea view room specifically, ask for it while checking in. The rooms are modern and clean. All rooms have standard amenities like air conditioning, wall LCD TV, refrigerator or a mini bar, personal safe, hair dryer, etc. However additional towels or pillows are charged extra. There is a swimming pool (although quite small) at the center with lounging chairs and umbrellas. There is also a baby pool. The hotel offers wifi in the lobby and the pool area. You won't get wifi or any form of internet connectivity in the rooms. The buffet breakfast is nice & simple but not with many choices. However the in-house restaurant and food served are quite good. We usually stay with the Malay preparations which are quite nice. Other than the restaurant, there is also an in-house cafe. There aren't any shops or restaurants nearby within walking distance from the hotel. So unless you come down to the hotel's restaurant by 8:30pm for your dinner, you may not find anything to eat. Another alternative is to take a taxi or hire a car and go down to the Pantai Cenang area where you will find plethora of dining options and most are open until late night. The hotel organizes several island and boating tours (talk to the front desk). There is an in-house gift & souvenir shop and also meeting rooms. Enough car parking is available. Check in at 3pm and check out at 12 noon. The hotel is close to the airport, and rooms are clean & spacious. It is in a quiet area. So if you want to have a quiet stay being a little off from the typical touristy area while being in a reasonably accessible distance from the main attractions, this hotel can be a nice choice. You will however need a taxi or a car to get around. The staffs are very friendly, prompt and helpful. The Malay dishes in the restaurant are quite nice and the chef really prepares them with a lot of delicate care. The swimming pool is quite small and often not very clean. We have sometimes found floating leaves and weeds. The water in the baby pool also looked stagnant. Sometimes the beds are bit of a problem. At times they would join two beds to make one and the gap in between would make it quite uncomfortable to sleep. The bed sheets are sometimes not big enough to cover both beds properly, and at night you may end up adjusting it to keep it in place. The buffet breakfast has not much varieties,. So if you are staying in the hotel for several nights, the breakfast can easily become quite monotonous. The hotel is not close to any beach. If you like to stay by the beachside, you should not choose this hotel. However, for comfortable night stay with basic amenities, this hotel would serve you well. 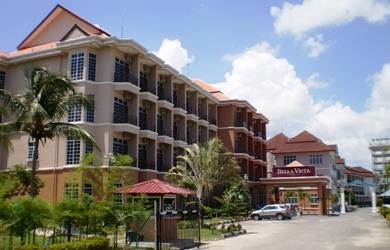 The hotel is located in Padang Matsirat close to the western shoreline and only few minutes from the Langkawi Airport. The Langkasukha Jetty for a boat trip to Rebak island is very near. NOTE: Do not confuse this hotel with Bella Vista Resort & Spa in Kuah. That's a separate hotel.